NEW YORK (CNS) — The burly demolition specialist who lent his name to 2012’s “Wreck-It Ralph” returns to the big screen in the sweet animated follow-up “Ralph Breaks the Internet” (Disney). So too does the best friend he acquired in the first outing, diminutive race car driver Vanellope von Schweetz. As they did six years ago, John C. Reilly and Sarah Silverman provide the voices for the physically and temperamentally diverse duo — both of whom, as fans of the original will recall, are arcade game characters in an establishment owned by, and named after, Stan Litwak (voice of Ed O’Neill). As the sequel opens, routine-averse Vanellope is bored by the predictability of her game, “Sugar Rush.” So Ralph blazes a new detour from the course she constantly follows — with unexpected consequences. To avert this calamity, Ralph and Vanellope take to the internet (Litwak has recently installed Wi-Fi) and head for the movie’s version of eBay. What follows is a picturesque and often funny adventure that satirizes everything from search engines — Alan Tudyk voices a nerdy anthropomorphized version of Google called KnowsMore — to the princesses featured in other Disney movies. Vanellope loves the new and challenging environment of the internet, especially after she’s befriended by Shank (Gal Gadot), a glamorous driver on the mean streets of a gritty game called “Slaughter Race.” But Ralph just wants to return as quickly as possible to the safe confines of Litwak’s. Tensions develop and their unexpected excursion winds up putting not only their resourcefulness but their relationship to the test. Directors Phil Johnston and Rich Moore’s picture (Johnson penned the script with Pamela Ribon) eventually delivers reassuring lessons about loyalty and forgiveness. It also sends the message that people with different personalities and outlooks can still be close pals. Easily frightened kids might find the difficulties through which Ralph and Vanellope pass too much for them. And some parents may consider Vanellope’s fondness for childish potty-themed puns tiresome, though she only indulges this taste, or lack of it, occasionally. 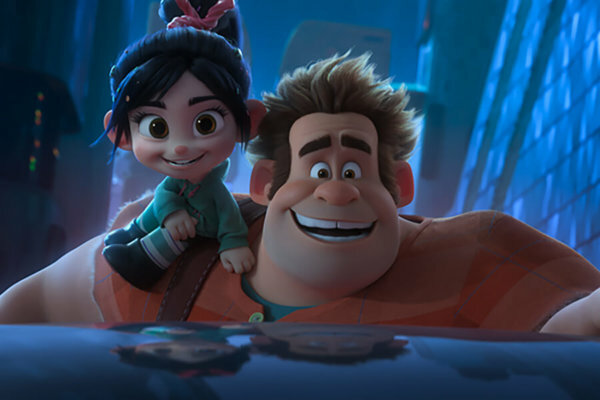 The charms of “Ralph Breaks the Internet,” though, far outweigh such minor glitches, and it can be recommended for most age groups.